Larry David returned to “SNL” to reprise his long-running role as Bernie Sanders, joking about the controversy his monologue stirred up during turn as host during the show’s Nov. 4 episode. David’s Sanders was part of an ad promoting the Democratic Party after its recent gubernatorial wins. Recovering from the big loss in the 2016, the ad finds Nancy Pelosi (Heidi Gardner), Tim Kain (Mikey Day), Chuck Schumer (Alex Moffat), and Deborah Feinstein (Cecily Strong) woodenly trying to appeal to voters. “We know what Americans really care about is jobs,” Pelosi said. David was making light of his own joke from the previous week’s episode when he hosted “SNL.” During his monologue, David did a bit imagining what his life would have been like in a German concentration camp. “I’ve always been obsessed with women, and I’ve often wondered: If I’d grown up in Poland when Hitler came to power and was sent to a concentration camp, would I still be checking out women in the camp?” he said. “I think I would. ‘Hey, Shlomo, hey, look at that one over by Barracks 8. Oh my God, what a knockout. Is she gorgeous or what? I’ve been eyeing her for weeks. I would love to go up and say something to her,'” he continued. 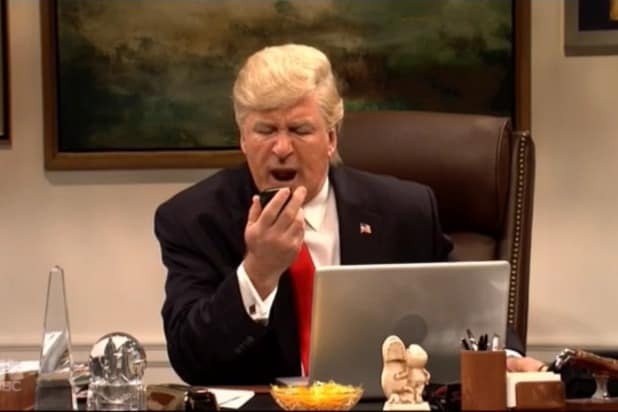 Some viewers reacted negatively to the monologue, calling it offensive, as chronicled on Twitter. As the ad continued, the other Democrats noted that they looked forward to getting Sanders’ passionate Millennial voters to back the party. “No, if you liked it, you should have put a ring on it,” David’s Sanders said.